When you get to False Cape State Park, stop and close your eyes. Imagine you're Captain John Smith stepping foot on land for the first time in months. Imagine what he might have felt as he gazed at this quiet, wild, desolate beach, birds screeching overhead. Now open your eyes. This is what John Smith might have seen. 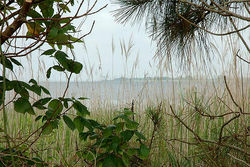 This spectacular setting is a mile-wide sand barrier between Back Bay Wildlife Refuge and the Atlantic. Activities are limited to hiking, bicycling or boating. You can camp here, but it's very primitive (no electricity, restrooms, etc.) and you have to bring your own water. Hunting of deer and feral pigs is allowed on a limited basis. How did the park get its name? Sailors used to mistake it for Cape Henry...and ended up shipwrecked, giving False Cape its reputation as a ship’s graveyard. In fact, many of the buildings in the local community, Wash Woods, were built by shipwreck survivors using cypress wood from their wrecked ships. Just remember, access to the park is only through Back Bay Wildlife Refuge. Those wishing to visit the park for the day must either bike or hike through the refuge (via beach or interior trails, and the interior trail is closed from November 1 through March 31), or by boat or canoe. During the summer season an ecologically-friendly tram--called the Terra Gator-- is available to take you from Back Bay and back, for $8 per person, round trip. Location: 4001 Sandpiper Road - 757-426-7128 - You can view a PDF of the False Cape State Park brochure and map by clicking here. The park accommodates primitive camping year-round, tents only, and offers 12 sites. (Some sites allow four people, others up to 12, so call for details). Drinking water is available in three locations. Campers must bring empty containers to transport water. Water not suitable for drinking is available in each camping area. You must carry everything in and out. There are several pit (i.e., non-flushing) toilets. Open fires are not permitted; camp stoves may be used for cooking. Groups of 10 must get a special use permit from the Back Bay National Wildlife Refuge at least two weeks before their trip. Remember: access to False Cape is on foot only, so be prepared to carry everything in by backpack! For camping information, contact the State Parks Reservation Center at 1-800-933-7275.